@Nucleus yes, that same formation that your little tweak changed it to another level. 😂 After challenges, testing tactics is my fav FMM pastime. It’s the formation I used in my power of Five career. You messaged me asking which tactic/formation I was using. @Nucleus yes, i asked u for tactic because there is allways to learn something from better managers tactics. Still i did create this tactic myself, your ideas and tweaks just made it worldbeater and Mbappe reaching 100 goals per season . I had no clue u were using this tactic. I have never seen your tactic. Second truth is my tactic was inspired by your When Harry met Sane. We are monitoring whether the game could be very slightly on the tough side but we would like to take the time to figure out full underlying reasons rather than make knee-jerk changes. Having said this, more managers are still having success than are not, according to our stats. I realize that we here are just a small sample size of your audience but, for my money, this is the closest you've gotten to a difficulty that feels "right". Com'è reale questo gioco se in modo assente ogni avversario colpirà 30 yard per ogni partita. Il secondo problema sembra essere un pezzo. Ogni angolo e punizione sono pericolosi e totalizzano il punteggio di 1/2 di loro. Per me, il gioco sembra essere ingiocabile per me. Ho provato più formazioni, molti difensori e nessuno di loro sembra funzionare. Sono solo uno con questo problema? I hope they don’t make the game easier. I’m still dominating with a top team but it is slightly harder than last year which I like. I’ll try a lower league team soon. It’s the training I haven’t got used to yet. For me the problem is not the game becoming more difficult (which is welcome) but the way it has been done with things like 4 goal comebacks in the last 10 minutes and so many goals from corners and worldie screamers. Long shots could be worth looking into, but I would hazard a guess that the comebacks could be due to the human manager failing to adapt to the opposition changing approach when behind, as the AI for this has seen a but of work. Agreed but when a lot of these comebacks are worldies or set pieces it's just frustrating as those are things we simply have zero control over yet it's put down as human error. 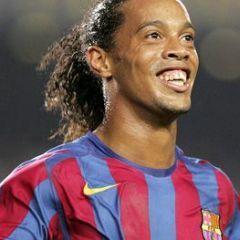 Admittedly I've not seen it happen much personally but I have seen potential come backs with ridicules goals flying in. 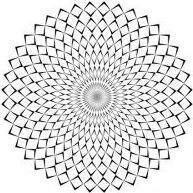 I know we're meant to react to changes with changes but knowing that makes a new calculation every time does always make me hesitate, like is my current path the right one or will a change rewrite the future for good or bad haha. I’m not having them either. This is a game of attributes and if your team are lacking in certain ones then I find that’s when you get things like comebacks and just conceding too many in general. Strength in cm roles is one for example Keita at Liverpool only has 10 so for me he just has to be sold as I like a minimum of 14 and preferably over 15. I have nothing against late comebacks, but this just doesmt seems legit that Ai can score from 3 set pieces in 10 minutes. Set pieces are over scored in both ways in my opinion. That is only problem left for me. Definitely enjoying a more challenging game this year and seeing more variation in the AI's approach. I found once you had a strong enough team in 18, the opposition would more often than not stick to contain and narrow for 90 minutes even if they were only a goal behind with 20 minutes to go; realistically you'd expect them to push for an equaliser at some point or at least adjust their tactics during the game if they identified a weakness in yours. Think this is a perfect of the famous comeback system this year (the first goal was a 30 yarder & thier first comeback goal waa from a corner). Imo best part is that I switched up my tatic settings so it could be solid defensively and hold the lead, and they scored all 3 goals while remaing on defensive. There's always a game or two, three of these a season where you go WTF regardless any counter-tactics, but the AI managers seem to be throwing curveballs at will atm. I think this may be down to the human managers not being used to this year's AI. While formations may not change often, I've noticed that their team mentality shifts several times per match based on the game state - when behind, the AI often changes to attacking/overload mentality, especially late in the match. And while goals are often worldies (I have a theory that this is more of an issue with how the engine shows goals rather than the fact that the engine RNG's a goal to happen), bottom line is that in a match between two roughly equal teams, when one team goes for broke and is actually able to hold on to the ball for a bit - it succeeds fairly often. I'm personally not having as much of an issue with late goals against me. Partially because I adjust my tactics several times per match to counteract the AI especially if something isn't working to my liking. If winning late, I'll turn on time wasting, change my players to more defensive roles, use more short passing (if not on already) to control possession, etc. I've always played like this so this year's results don't seem different to me. But I'm guessing most people here don't micromanage the match like I do and, as a result, they are not properly responding to the AI's increased aggressiveness when behind late. This is a perfect example of what I'm talking about. How do you expect your team to play cohesively when you have three(!) players as APs while at the same time telling the rest of your team to form a defensive shell? You created a giant hole in the midfield so it's little wonder you got rocked like that. This year's AI has leveled up and is smarter. We have been asking for the AI to be more challenging and we finally got it. Now, you can't just click play, fly through 90 minutes at the fastest possible speed without any adjustments, and not expect to pick up a few bumps and bruises. That's not how real football works and, finally, that's not how FMM works. This year's AI asks us, as managers, to be more attentive, active, and flexible. And I'm loving it. But I'm guessing most pe﻿ople here don't micromanage the﻿ ﻿match like I do and, as a result, they are not properly responding﻿ to the﻿ AI's increased aggressiveness when behind late﻿﻿﻿. I'm definitely not micromanaging right now, merely playing a few seasons to feel the game out. I only micromanage during (hard) challenges, looking for exploits in set-ups or players in particular. I don't like to waste too much time tweaking tactics during regular careers tbh but hey, maybe you're right and we do need to respond more actively do the AI at times. Tho I'd have to add that conceding one or two goals late in the game is realistic enough, but 3 or 4 at the end of a good match we've dominated up till that point is not. How do you expect﻿ your team to play cohesively when you have three(!) players﻿ as APs while at the same time telling the rest of your team﻿ to form a defensive shell? You created a giant hole in the midfield so it's little wonder you got rocked﻿ like that. I'm actually playing as Spurs in this save, sorry if I didn't make it clear enough. But you pointed out why this year's comeback system feels like it's just unrealistic some times. Southampton had three APs on the pitch while also remaing on defensive still, exploiting thier midfield like you said. Thier collective team stamina were in the mid to low 70s, which I tried exploiting by subbing in new players and focusing down both flanks. 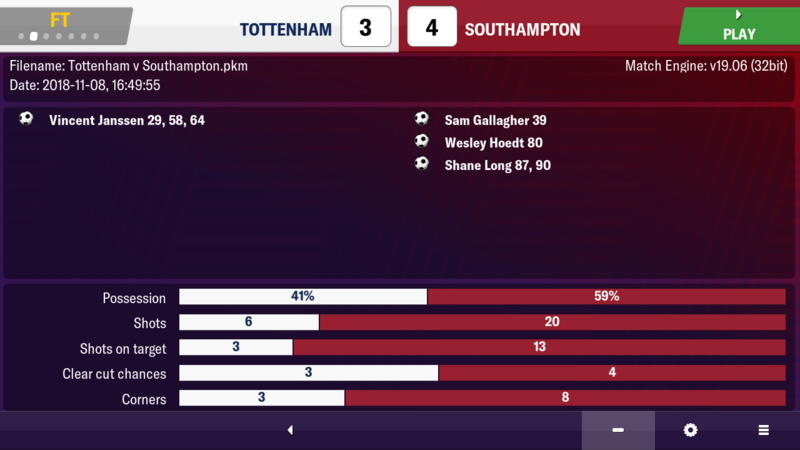 Yet they still managed to score three goals in 10 minutes to complete a seemingly not existent comeback, despite the tweaking I did to my formation and tactics. This also doesn't take into account the difference in player quality here either. I'm not trying to say that this is happening every single game, or that it's completely unrealistc and unejoyable to play against a smarter AI this year.It just feels cheap when they usually do so by scoring a screamer or corner in 74+ minute, followed be a peroid of your defence just all of a sudden going brain dead and shipping in 2-3 extra goals. I probably would've concentrated more on exploiting the hole in their midfield by either flooding the midfield with an extra midfielder or going aggressive by attacking and bypassing half of their team. They had all the possession and you can't win that by only bringing on fresher players. Still though, I agree that you got some bad RNG against you there at the end. Funny enough I remeber thinking that I should bring a DM on instead and just retain possession, but I just got too paranoid thinking about my player's avg rating dropping because I brought them on to late (silly I know). But I completing agree with you on all points, the player can't just run and gun anymore (at least for the moment) and really tweak your tatics on a regular basis if you want to become that powerhouse team. The game is still enjoyable overall imo l, which is what really matters. 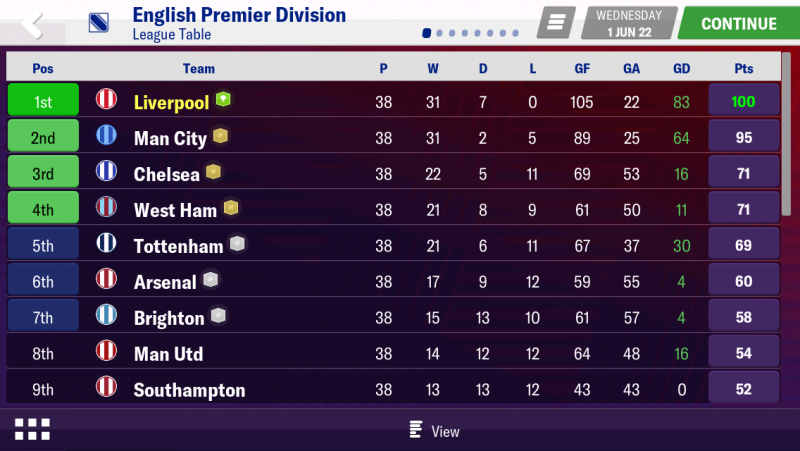 Just had my first unbeaten season in epl on this years game and didn’t conceal many goals at all. This is my team below. 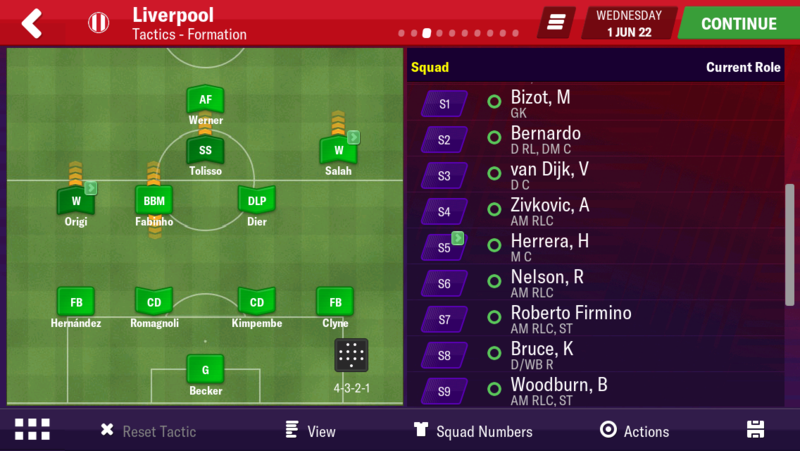 Its 2022 and I have a fairly decent team but not the best it could be. I’m more or less treating this as a test save using my tactic from last years game and it seems to work. I didn’t even do much in game tweaking tbh.